Sukumar Roy was elder son of Upendra Kishore Roy Chowdhury who was the bright jewel of Bengali children's literature. Sukumar was born in the golden age of Bengali Renaissance. He was a pioneer of 'nonsense rime' in Bengali literature. His writing creation that excites us till today. That list includes 'Abol Tabol', 'Pagla Dasu', 'H Z B R L', 'Chalochchtra Chanchari', 'Khai-Khai', 'Abak Jolpan' etc. the midst of numerous gem. 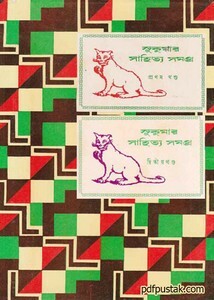 Today we want to post Sukumar Sahitya Somogra part- 1 and 2 as pdf. Part one has 331 pages with 10mb pdf size and part two has 341 pages with 12mb pdf size.